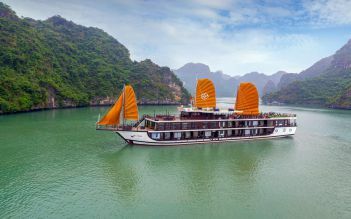 La Regina Royal cruise, the charming younger sister of La Regina Legend cruise, is not merely as elegant and luxurious in every detail as her sister, but also youth-oriented with a cozy atmosphere and a delightful blend of traditional Vietnamese design. 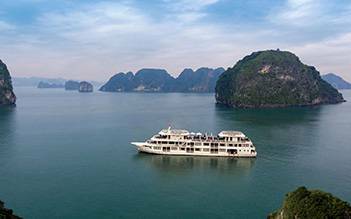 A cruise trip with La Regina Royal is a combination of the bay’s most magnificent scenery, local attractions, and onboard amenities. Get ready for your most unforgettable moment on La Regina Royal. 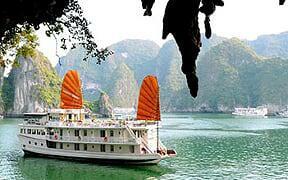 7:30 - 8:30 Optional shuttle bus will pick you up at your hotels in Hanoi Old Quarter and transfer to Halong Bay. 12:45 Check in aboard with Welcome Cocktail from crew member while manager introduces the safety briefing and the boat cruising forward to the Bai Tu Long bay. 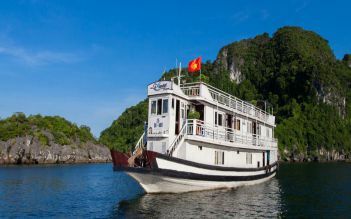 15:30 Visiting Vung Vieng floating fishing village, one of the biggest village in Halong Bay, you will have the chance to learn about the living of fishermen and feel free with some optional activities: bamboo boat or kayaking. Beside having experienced daily life of fishermen, guests will stop over Pearl Village and cannot keep their eyes out of lovely jewelry made from pearl. 07:00 Light breakfast served in dining room. 07:45 Discover Thien Canh Son cave where located on top of the mountain, contain the long history of geological value and natural beauty. Recommend you bring camera and wear sports shoes for hiking. 09:00 - 9:30 Back to the main boat for relaxing and check out at the reception, please put all your luggage at the outside of your cabin door, the crew member will help to bring luggage on land. 11:00 Disembark at the harbor. Get on the shuttle bus and get back to Hanoi. An incredible trip and by some fluke we had the ship to ourselves (5 of us in a 30 cabin ship!!!!) and were truly spoiled by Sonny and his team. The guys have a wickedly funny sense of humour and really looked after us. The scenery is amazing, we had a cooking lesson and did Tai Chi at 6am (sorry guys, you wanted a lie-in!) 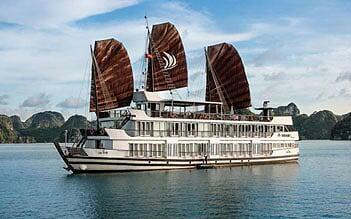 The staff are fabulous, really helpful and the ship is beautiful. We visited a floating village, a huge mountain cave and although it was Jan and the weather not so sunny it was all still spectacular. I can’t recommend them enough. We did an overnight 2 day trip. The food was incredible and so much of it!!! Be prepared to eat a lot! So a big thank you to La Regina. They are the only ones to choose. You may be offered slightly cheaper cruises but you won’t see the tourists smiling like we did! For a few dollars more go with the team that really know what they are doing and enjoy being spoiled for once.